Enjoy views of Fort Knox and the surrounding valley from atop the Penobscot Narrows Bridge Observatory. No trip to Maine would be complete without exploring the state’s many historic and covered bridges. With an impressive number of bridges listed on the National Register of Historic Places – 22, to be exact – Maine is chock full of unique bridges with historic, architectural or cultural significance. The covered wooden bridges sprinkled across the state are of special interest to history buffs. At one time, there were 120 covered bridges spanning Maine’s streams and rivers. However, time, ice, floods, fires and storms — especially the massive 1896 storm known as the “Great Freshet” — have since destroyed and washed away most of the original structures. In many of the sites where wooden bridges once stood, modern steel structures have taken their places. However, a few historic bridges still stand today as a tribute to their builders’ skills, creativity and ingenuity. While records and documents providing information about individual builder are few and far between, most bridges were constructed by local village woodworkers in the early days of the 19th century. One of the most notable features of these historic structures is their superior – and clever – craftsmanship. Though none of these early builders had engineering degrees, their creations reflect the inventive techniques of the period that has provided bridges with their sturdy frames for hundreds of years. And, although the bridges’ covers make for picturesque photo opportunities today, their builders covered them for an important – and practical — reason: To keep Maine’s snow and rain from rotting away their timbers. Maine’s state government recognizes the importance of preserving these historic bridges for future generations to enjoy. Since 1959, the state legislature has provided the Department of Transportation with the authority to renovate and preserve significant bridges across the state. And, as transportation technology advances, many historic bridges have been strengthened and retrofitted in order to facilitate the flow of traffic. Many others have been limited to foot and bicycle traffic only in order to ensure their survival. When visiting these bridges, don’t forget to bring a camera, as many offer a picturesque glimpse into the Maine of days gone by – as well as a visible record of the creative blend of architecture, art, engineering and technology that went into their construction. When you think of historic covered bridges, you may imagine a quaint wooden structure spanning a lazy river, perhaps bordered by trees sporting gorgeous red, gold and orange fall foliage. In Maine, this image is the reality. In the 1800s, these covered bridges began popping up around the state. For the first time, horse-drawn carriages could easily ford Maine’s rushing rivers, greatly simplifying residents’ ability to travel within the state. Though from the outside many covered bridges resemble barns or sheds that just happen to span a waterway, a look inside reveals their unique – and often ingenious – designs. These bridges are supported by a set of chords, or strong beams, that lie parallel to the road and are connected by crossing braces and posts. The lower chords provide a foundation for the floor planks, creating a type of structure known as a through truss. Though once there were at least 120 covered bridges in Maine, today just nine remain. Also known as the Sunday River Bridge, the Artist’s Covered Bridge is among the most famous – and most photographed and painted, thus inspiring its name – covered bridges in Maine. Built in 1872, this picturesque wooden bridge spans the Sunday River near Newry. This 87-foot bridge, constructed in the Paddleford truss style, was taken out of commission in 1958. To find the Artist’s Covered Bridge, drive down the Sunday River Road about four miles northwest of North Bethel. The fully enclosed Babb’s Bridge dates from 1864, but the original burned in 1973. Today, an exact replica stands in the same place. This bridge spans the Presumpcot River about 3 miles northwest of South Windham. Unlike many other historic bridges, it’s open to traffic. Babb’s Bridge has a 79-foot span and a Howe truss. It’s located at the confluence of Hurricane Road and Covered Bridge Road. To find the Bennett Bridge, travel about 1.5 miles south of Wilson Mills to the end of Littlehale Road. This Paddleford truss – also known as a modified Long truss — bridge spans the Magalloway River and has a length of 93 feet. It was constructed in 1901 and has been closed to traffic since 1985. The Hemlock Bridge was built in 1857, but reinforced to handle traffic in 1988. This 109-foot-long bridge was constructed with a Paddleford truss and has laminated arches. It spans a channel of the Saco River and is located on Frog Alley Road about 3 miles northwest of East Fryeburg. The state’s shortest covered bridge — with a span of just 70 feet — the Lovejoy Bridge crosses the Ellis River just off of Main Street in South Andover. This 1868 bridge has a Paddleford truss and was reinforced to support local traffic in 1984. Lowe’s Bridge was originally constructed in 1857, but spring flooding washed it away in 1987. Three years later, a modern replica was built over the Piscataquis River. This 120-foot bridge has a Long truss and is located south of Guildford Village, just off of State Route 15. In 1859, the villages of Parsonsfield and Porter collaborated to span the Ossipee River. Together, they built the Parsonsfield-Porter Bridge, a 152-foot long structure with a Paddleford truss. It’s strengthened with laminate wooden arches, but was closed to traffic in 1960. The bridge is about .5 miles south of Porter off of North Road. The Robyville Bridge dates from 1876 and is the state’s only completely shingle-covered bridge. Built with a Long truss and stone abutments, this bridge spans 73 feet over the Kenduskeag Stream. It’s located in the town of Corinth, about 3 miles to the northwest of Kenduskeag Village on Covered Bridge Road, and was reinforced for local traffic in 1984. The Watson Settlement Bridge is both the newest and the northernmost of Maine’s original covered bridges. Built in 1911, this 170-foot-long bridge spans the Meduxnekeag Stream and has a timber Howe truss. It’s been closed to traffic since 1984 and is located on Carson Road in Littleton. Aside from Maine’s remaining nine covered bridges, the state is home to a number of historically significant structures, including four bridges known for their unique architecture, engineering and innovative design. The Bailey Island Bridge, also known as the Cribstone Bridge, connects Bailey Island to Orr’s Island. For decades, the fisher folk who lived on these islands just off the coast of Harpswell asked the town to construct a bridge – but their requests were always denied. Finally, after some legal wrangling within the Maine legislature, the town and county developed a plan for bridge construction in 1926. But the task was easier suggested than done; the tides between the islands – known as Will’s Gut – were tricky, and the bridge design had to account for the movement of wind and waves without increasing the currents produced by tidal ebb and flow. The design process, headed by engineer Llewelyn N. Edwards, utilized 10,000 tons of Maine granite to create a cribstone-style bridge. This locally quarried stone was chosen for its ability to withstand wind and waves, while the open cribwork allowed water to pass through as the tides receded and advanced. The bridge’s 1,150-foot span took a year to complete. Sidewalks and guard rails were added in later decades, but today the bridge still stands as the only granite cribstone bridge in the world. This unique bridge is a Historic Civil Engineering Landmark and is included on the National Register of Historic Places. About 3 miles south of East Lebanon, the 54-foot-long Grist Mill Bridge spans the Little River. Though it was first constructed around 1885 from round-log stringers, a wood-planking deck and triangular-shaped guard rail supports, this bridge’s current stone and timber configuration was built in the 1950s. The picturesque Grist Mill Bridge is supported by stacks of rubblestone, which jut 13 feet above the steam bed. The bridge was listed on the National Register of Historic Places in 1990, and a 1993 renovation returned its stone abutments and pier to their earlier glory. Sewall’s Bridge is the country’s oldest wood-piling bridge. Built in 1761 by Major Samuel Sewall, Jr., the bridge was initially constructed to continue Organig Road across the York River. Before the bridge was built, locals had to take a canoe or a ferry across the water to get to church, neither of which was particularly safe in stormy weather. The bridge’s builders determined the proper length of each individual piling by probing the river bed with a long, iron-tipped pole. Once piles were cut, they were pounded into the river bottom with large oak logs. In its original incarnation, Sewall’s Bridge had a draw. After centuries of use, the bridge was replaced in 1934 with a wooden replica that’s still working today. However, this historic wooden bridge was almost replaced by a concrete version; a 1933 vote, the residents of York voted on whether to use wood or concrete – and wood triumphed by just one vote. In 1986, this 255 foot long bridge was dedicated as a Historic Civil Engineering Landmark. The Wire Bridge is truly one of a kind: Though four such bridges used to exist in Maine alone, today New Portland’s Wire Bridge is the sole surviving wire suspension bridge in the U.S. It was originally built between 1864 and 1866 by Captain Charles B. Clark and David Elder. This unique structure is named for its steel support cables, which extend from twin towers that emerge from either end. The towers, which are constructed from timber frames and shingled with cedar planks, were reconstructed in 1961 during a bridge renovation. However, the original wooden tower frames and support cables remain intact today. The Wire Bridge spans the Carrabassett River near New Portland and is 198 feet long. Its preservation is guaranteed by 1959 legislation enacted in the Maine Legislature. No tour of Maine’s notable bridges would be complete without a stop at the Penobscot Narrows Bridge Observatory. Not only is this stunning structure one of only four such buildings on the planet, it’s the world’s tallest bridge observatory. This massive cable-stayed bridge, which spans the Penobscot River near Fort Knox, stretches for 2,120 feet from shore to shore. The bridge deck is 135 feet above the river, but its real appeal lies in its observatory, which towers 420 feet above the water. Speed to the top of the 447-foot-tall tower – that’s about 43 stories high — in an elevator, where you can enjoy 360-degree views of the surrounding Penobscot River Valley; on a clear day, you can see for up to 100 miles! The planning and design process began in 2002; construction was completed just 42 months later and cost $85 million. The Maine Department of Transportation partnered with FIGG to design the bridge. The bridge incorporates cutting-edge carbon fiber technology that led to a mention in “Popular Science” as one of 2006’s best innovations. The observatory opened in 2007 and welcomed more than 130,000 visitors in its first two years of operations alone. 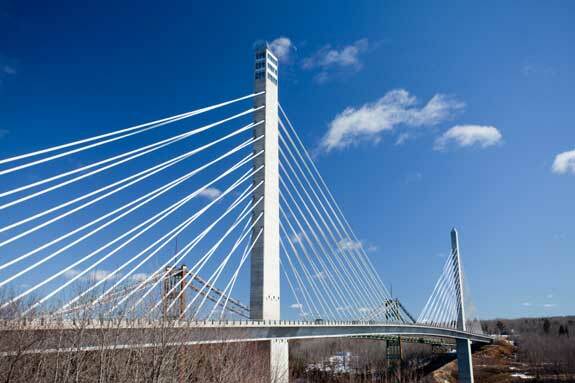 The Penobscot Narrows Bridge’s granite theme honors the stone’s importance to the regional economy, and the bridge’s two towers resemble the Washington Monument, which was made from granite quarried from Mt. Waldo. A Deer Isle quarry provided the granite tiles that grace the observatory’s floor. From quaint covered bridges from centuries past to space-age wonders, Maine’s unique bridges offer visitors the chance to witness human innovation, creativity and engineering first hand as they evolve through the ages.